Background: Patient care at the end of life is largely based on experience of provider and the care that is delivered may not be aligned with what was detailed by patient preference via prior directives. The National Consensus Project for Quality Palliative Care (NCP) has outlined the need to communicate the gravity of the prognosis for patients in which death is imminent.1 This is supported by the Institute of Medicine and the American College of Physicians High Value Care Task Force.2,3 However, it has been shown that in many patients’ final days of life, such conversations do not occur.4 Current trends show that in patients within our system with advanced illness, a POLST is on record on 13% of the time. In this prospective cohort study, we sought to determine if there was a relationship between level of training, confidence and presence of decisional conflict, a measure of uncertainty and readiness in making a decision, in making an accurate prognosis to two standardized cases. Methods: A questionnaire was administered to Internal Medicine Resident’s and Hospitalist Attending’s at UCLA. Decisional conflict was measured with the SURE tool, a validated 4-item tool that has been used in assessing for the presence of decisional conflict. Two cases were created with a ‘Gold Standard’ answer as determined by a faculty Palliative Care Attending Physician. After the provider made the prognosis choice, the SURE tool was administered to assess for decisional conflict. 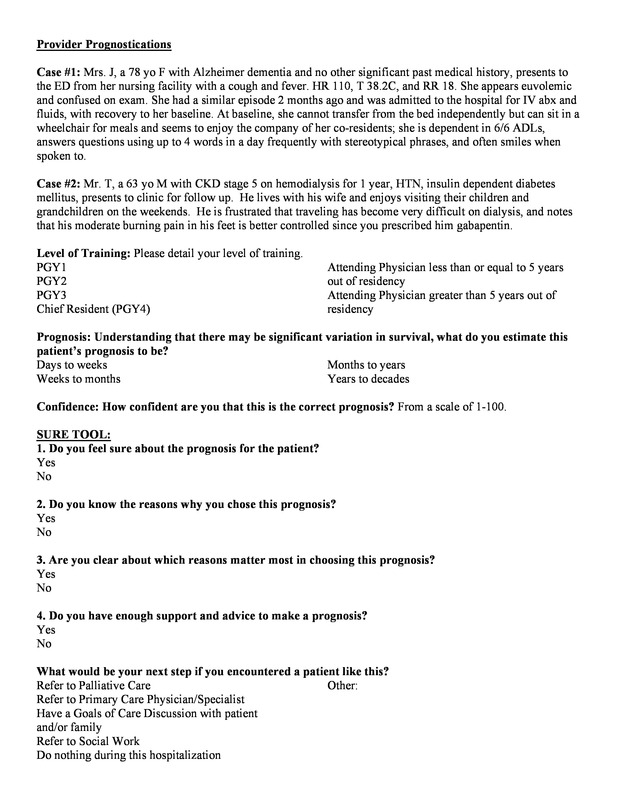 Follow-up questions assessed for confidence in that prognosis on a scale of 1 – 100, and what the next step would be if they encountered a patient similar to the case. The SURE tool (attached figure) consisted of four yes/no questions. Following administration, the SURE tool was scored and any 1 or more of the 4 questions marked as a “no” (a total score less than 3) was considered a positive result for decisional conflict. Results: 104 out of 233 providers (44.64% response rate) responded to the questionnaire. Statistical significance was taken to be a p-value of < 0.05. Decisional conflict diminishes with level of training regardless of the case. Feeling sure, knowing which reasons matter, and having enough support and advice is related to level of training regardless of the case. Knowing the reasons to choose a prognosis is related to level of training for a long-term prognosis. Confidence in prognosis was higher in providers that tested negative for decisional conflict. There was no association with planned choice of action with level of training. Most interesting, selecting the correct answer was not associated with level of training. Conclusions: These data demonstrate many opportunities for improvement and avenues by which Hospitalists can impact the health system with regards to end of life care. We identified that one’s confidence in prognostication increases as one advances in their training but overall prognostication skill/ability does not improve. Future directions indicate a need to provide housestaff education regarding palliative care to diminish decisional conflict when making a prognosis. Without specific training in prognostication, there is no reason to believe that providers will improve their prognostication ability. Moreover, this may suggest that goals of care conversations may be occurring with an incorrect prognosis. From the health system perspective, this has broad implications not the least of which is that the POLST would not be completed in patients who it may be appropriate for given actual prognosis. Namavar, AA;	Afsarmanesh, N;	Busuttil, A;	Vangala, S;	Pietras, C;	Dowling, EP	. PROGNOSTICATION ABILITY AMONG INTERNAL MEDICINE PROVIDERS. Abstract published at Hospital Medicine 2017, May 1-4, 2017; Las Vegas, Nev. Abstract 49. Journal of Hospital Medicine. 2017; 12 (suppl 2). https://www.shmabstracts.com/abstract/prognostication-ability-among-internal-medicine-providers/. Accessed April 22, 2019.